This project involved Jubilee and Sudbourne Primary Schools and Evelyn Grace Academy. During October 2016 Art4Space worked with chosen classes to explore the concept of modern citizenship. Citizenship across primary and secondary helps children and young people’s social development enabling them to engage with others, to develop understanding of their communities and society, and providing opportunities for responsible and active citizenship. Art4Space worked with the pupils to trigger ideas for the content of the artwork in the form of drawings, doodles, words and quotes which then informed an overall design and transferred into this set of paintings by Art4Space and muralist Jade Perry. Being active in the schools was an opportunity to raise awareness with children, young people, teachers, parents and the wider community about the Brixton Your New Town Hall Project, a scheme that will reduce Lambeth Council’s core office buildings from 14 to 2, saving at least £4.5m a year, provide scores of new homes. It will also rejuvenate Lambeth’s iconic Town Hall, making it more open and accessible to residents for community use and enterprise. “I admire what the children have created around the theme of citizenship and their feelings about Your New Town Hall Project, the paintings will create a wonderful outside gallery for all to enjoy for many months during the construction work. 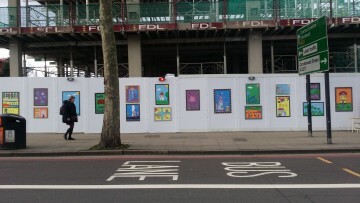 What a way to brighten up the streets!” Julie Norburn, director, Art4Space.